I’m almost finished with the Ruby Slippers for Stella, and I’ve figured out why the toes look so weird. I’m picking up stitches incorrectly. I’ve been using two needles instead of one, and it pulls the wool something fierce. Since Stella’s feet are already almost too big for the infant size, I’m going to make another pair next size up. The Irish Hiking Scarf really looks good, George has even commented on how nice it’s turning out. Something like, “It looks like the sleeve on an Irish sweater.” Oh, you mean like this? (The Aran Fishing Sweater is in my queue, should I ever work up enough nerve to do a sweater for myself.) I’ve finally memorized the scarf pattern, so it’s that much easier to work on while I’m cooking dinner or listening to a book on CD with the boys. Oh, and for those who’ve been asking, the bread turned out good. I made a second loaf, which was much better — I added the roasted garlic before the bread proofed, so it was mixed throughout the loaf. The soup wasn’t my best batch. I used Yellow Tail Cabernet-Shiraz blend, which just wasn’t dry enough. Next time I must remember to go for a straight Cab, it seems to make the difference. Too busy? Can’t afford to waste any time? Then whatever you do, don’t click here. This entry was posted in Uncategorized on January 31, 2008 by drasch. So I decided to bake some nice, crusty, peasant bread. And this is how it looks. I roasted some garlic, chopped and added it to the dough before it rose, and the whole house smells fantastic. I’m making a triple batch of Italian Sausage Tortellini Soup today, and tonight we feast. This entry was posted in Uncategorized on January 26, 2008 by drasch. So I’m watching the news today while I was getting dinner ready, and my parents were on the news. Not in a COPS kind of way, one of the good ones. Or click here to see the shorter version. OK, I’ve finally posted Stella’s birth story, you can click here to read it. Please note, it is not graphic, but it is the story of a natural birth, what it is really like. So if you’re afraid, don’t read it. This entry was posted in Uncategorized on January 21, 2008 by drasch. So the Irish Hiking Scarf is coming along quite nicely. Unknitting (AKA “tinking”) has really come in handy, as I knit the wrong side and had to rip back, but didn’t have to frog the whole thing. So far, so good. I intended that this would be a scarf for George, but I don’t know if it’s going to be wide enough; I may need to find a bulkier wool or use larger needles if it seems too narrow. We’ll see what he thinks; I’m sure that someone else could use it if he decides he doesn’t like it. This entry was posted in Uncategorized on January 17, 2008 by drasch. 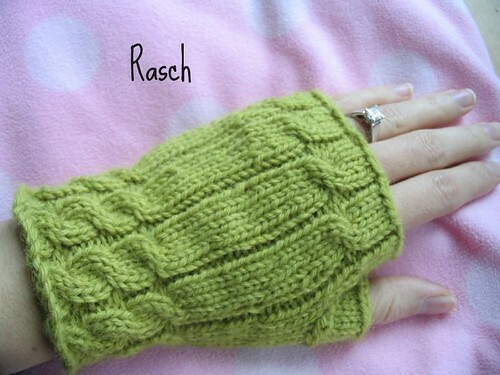 So Fetching is finished, and I’m not thrilled with the thumbs, but they are warm and wearable. I need to dig out my tripod and take some photos, I just don’t seem to have time when there’s decent natural light around. Oh, and I taught myself how to unknit today! I am so proud, I’m going around unknitting everything in sight. No more frogging-the-whole-thing-because-I-had-a-yarn-over-somewhere. I am so happy, especially since this Irish Hiking Scarf requires attention while knitting. This entry was posted in Uncategorized on January 16, 2008 by drasch. I’m finished with the left mitt, and about 30% done with the right one. Sweetie Pea was happy to see Daddy today. This entry was posted in Uncategorized on January 12, 2008 by drasch.